When the top picture was taken, the road was named the Williamsburgh & Jamaica Turnpike, and the locale was Richmond Hill. 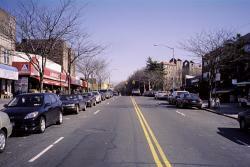 Today, the road is Metropolitan Avenue and the locale is called Kew Gardens. You are looking east toward Jamaica from today's Audley Street. The Turnpike opened in 1816 and became a farmer's and stage coach route to the Williamsburgh ferries. It was most likely this road that Albon Man used to travel to and from his summer home in Lawrence, and from which he first saw the land he and his family would develop into Richmond Hill and Kew Gardens.